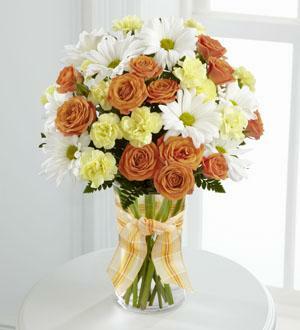 The Sweet Splendor™ Bouquet by FTD® radiates cheer and well-wishes with every sun-filled bloom! 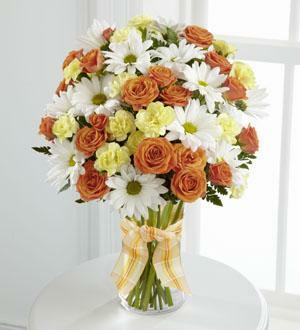 Orange spray roses, yellow mini carnations, white traditional daisies and lush greens are brought together in a classic clear glass vase accented with a designer apricot plaid ribbon to create a bouquet set to brighten any day. GOOD bouquet includes 8 stems. Approximately 14"H x 10"W.
BETTER bouquet includes 13 stems. 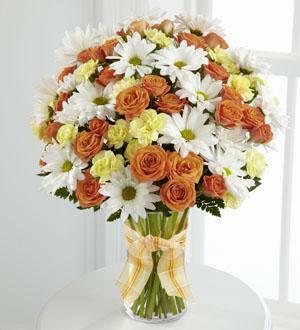 Approximately 15"H x 11"W.
BEST bouquet includes 19 stems. Approximately 16"H x 12"W.